Jo Co Painting LLC proudly offers Exterior Painting in Overland Park Kansas. We can paint any exterior item in Overland Park! Our Overland Park exterior painters will paint your shingles, siding, deck, doors, eaves, porch, and railings. We can paint the exterior your Overland Park garage, shed, fence, and light posts. We even paint metal, such as sliding doors, windows, and metal railings. 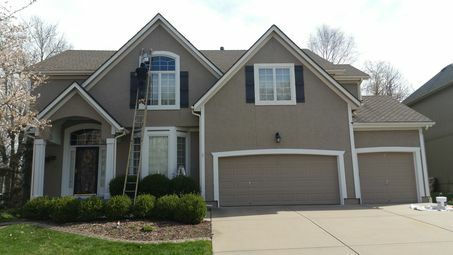 If its in Overland Park exterior painting is an extreme possibility. If you have ever tried painting the exterior of your Overland Park Kansas home or business, you know that its not an easy task. Exterior Painting in Overland Park Kansas is both an art and a skill. That's why Jo Co Painting LLC's professional Overland Park exterior painters must have several years of experience painting the exteriors of Overland Park homes and Overland Park offices and be familiar with Overland Park's various construction materials and exterior architectural styles. When it comes to cost-effective quality exterior painting in Overland Park, Kansas, Jo Co Painting LLC is the exterior painter Overland Park residents and Overland Park business owners trust.